Potatoes are so versatile, especially for us Celiacs. It is a vegetable that we can make use of in many recipes, from gnocchi and potato cakes to pie crusts! However, one of my favorite potato recipes is this Potato Galette. There are many methods on how to make this dish, but this version is simpler as we are going to make it in a non stick cookie sheet for small ones or a large one in a springform pan. Or you can even try making them in a mini size by using a muffin tin or mold as explained below. Preheat oven to 200 deg C. Peel the potatoes and slice them into wafer thin slices using a knife or a mandolin. The thinner the better. 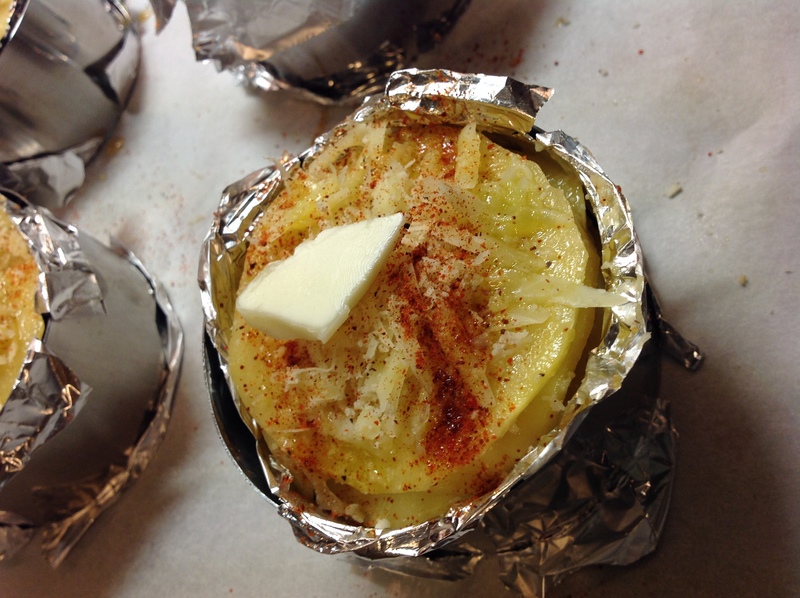 Place the potatoes in a plastic bag, pour in the olive oil, salt and pepper and gently toss the potato slices in the bag so all the slices are covered in oil and seasonings. To make a large galette, start arranging the potato slices from the middle into a concentric circle, working from the centre out, top with some onion, garlic, Parmesan and rosemary or thyme and continue layer upon layer until the slices are used. If making small ones, use same method but make an 4″ circle with the potato slices. Press it down so the potatoes settle in place. Sprinkle the top with more grated cheese and dot with butter. If you wish, you can also sprinkle the top with sweet paprika. Bake the galette for 45 minutes approximately (less if making the small or mini ones), or until the top is crispy and golden brown. Remove and cool for 10 minutes. You can either choose to serve it by transferring it onto a serving dish or if you prefer a uniform and flat spiral of potatoes, you can flip it over on to the serving plate by putting the plate on top of the cookie sheet or pan and then flip the pan over so the cookie sheet is at the top. 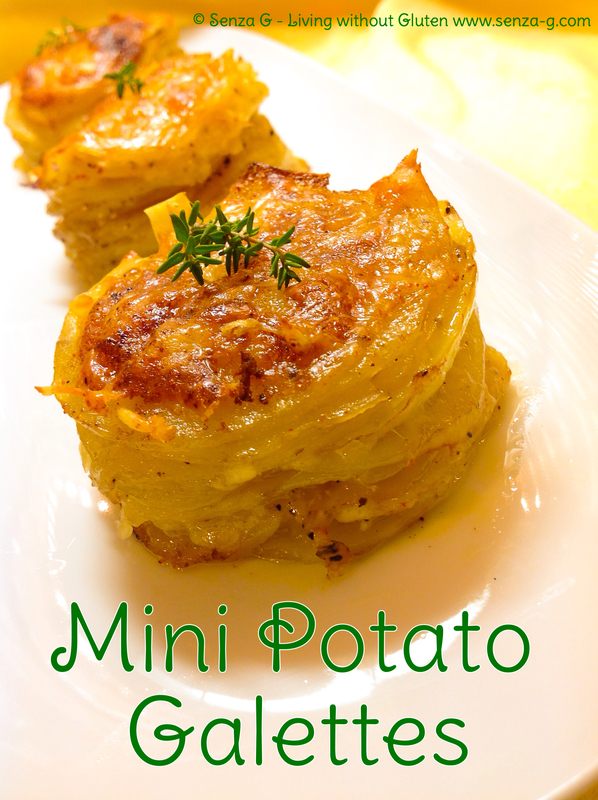 Below is another way of making mini potato galettes as I mentioned above. I layered them the same way in a muffin tin or molds but before I lined it with foil so it will be easy to lift out. Serve with thyme sprigs or rosemary as a garnish.